The Chinese emperor Kuang-wu-ti (6 B.C.-A.D. 57) was the founder of the Later Han dynasty. He reconstituted the civil administration, began a period of recuperation in domestic affairs, and restored peace to China's borders. Kuang-wu-ti is the posthumous title given to Liu Hsiu, the founder of the Later Han dynasty (25-220). He was a descendant of Emperor Ching (reigned 156-141 B.C. ); his family lived in modern-day Honan, a part of the landbased aristocracy. As a young man, Liu Hsiu went to the capital, Ch'ang-an, to study, but he preferred running the estate to scholarly activities and returned home. During the latter part of Emperor Wang Mang's reign, bandit groups, joined by leaders of the aristocracy, including Liu Hsiu and his elder brother Liu Posheng, rose in many parts of the country. The commoners in the bandit group of which the Liu brothers shared the leadership were distrustful of such aristocrats; hence they made a member of a non-aristocratic Liu family the Keng-shih emperor in A.D. 23. Keng-shih emperor opened the way for Liu Hsiu to ascend to the throne as Kuang-wu-ti in 25. Enthronement did not mean that Kuang-wu-ti's position was secure or even that he controlled all of China. During his rise to power there were at least 12 other competitors for the position of emperor; most of them claimed (many falsely) that they were descendants of the Former Han ruling house. The most serious contender for the throne was Kung-sun Shu, whose power base was located in Szechwan in western China. In addition to armed struggles, Kung-sun Shu and Kuang-wu-ti engaged in a propaganda war which was to have long-range influence in Chinese intellectual history. 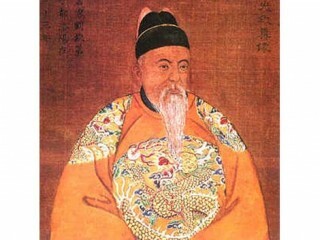 Kung-sun Shu claimed that the "Mandate of Heaven" was never given twice to any ruling family and that the cosmic forces indicated that someone in the western part of China should succeed Wang Mang. Kuang-wu-ti countered that Wang Mang should be regarded as a usurper who had interrupted Han's mandate to rule and that the cosmic forces showed that Han should continue to rule. Both men asserted that their information derived from Confucius's predictions, which were written down by later Confucianists. These materials, known as the Apocryphal Texts, were later edited on orders from Kuang-wu-ti and circulated throughout the empire. The texts became almost as important as the Confucian classics, and the thought in them provided the philosophical and psychological basis for the Later Han dynasty. Kuang-wu-ti did not complete his conquest of the empire until 36, but even before that time he had begun to reestablish the machinery of state. He moved the capital eastward to Loyang—the Former Han capital of Ch'angan had been sacked in the fall of Wang Mang. He tried to be as economical as possible in the construction of new palaces and other buildings. Similarly, his state structure was largely the same as that of Former Han, but he reduced the cost of maintaining it by eliminating many offices and by abolishing over 400 local-level governmental units. The military office in the commanderies, roughly equivalent to modern provinces, was also abolished. This step was not taken as an economy measure so much as to make sure that no provincial official could mobilize armed forces which would endanger the central government. Both in his personal life and in his administration, Kuang-wu-ti, knowing that the resources of the country had been severely strained in the recent civil wars, was as frugal as possible. The people needed recuperation, and he did his best to give it to them. Kuang-wu-ti, because of the financial condition of the empire, proceeded quite cautiously in his relations with the non-Chinese border peoples. In the west the Emperor employed Ma YÃ¼an to use the twin policies of attack and pacification in order to bring peace on that border in the mid-30s. Ma YÃ¼an later led troops into present-day North Vietnam, which had broken away from China when Wang Mang's regime collapsed; by 44 this area was under Chinese control. In the north there was intermittent fighting between the Chinese and the Hsiung-nu but no major campaigns ensued; then, in the late 40s, the Hsiung-nu split into northern and southern blocs. The southern Hsiung-nu submitted to the Han and formed a buffer which protected the empire from the northern Hsiung-nu. Thus, without launching major and costly campaigns Kuang-wu-ti was able to restore peace on China's frontiers. In Kuang-wu-ti's restoration of the Han, the aristocracy played a much larger role in all aspects of life. The government was never as powerful as in the earlier period, nor were the borders as far flung. And yet, the founding of a regime which was to last for 2 centuries must be considered a major achievement. View the full website biography of Emperor Guangwu Of Han.